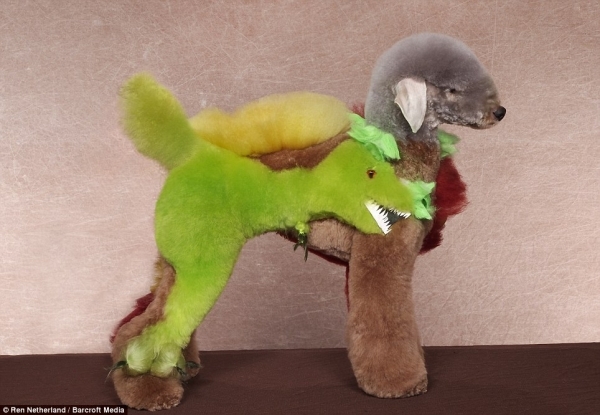 I found some photos of very elaborate, and maybe crazy, doggie hair styles. 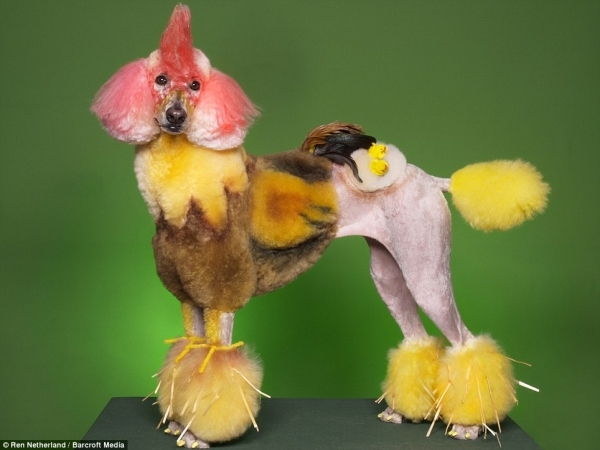 The puppy cut can make many dogs look really cute but it is amazing what some shaving, styling, additions, and color can do to make a dog look completely different! What do you think of these dogs? 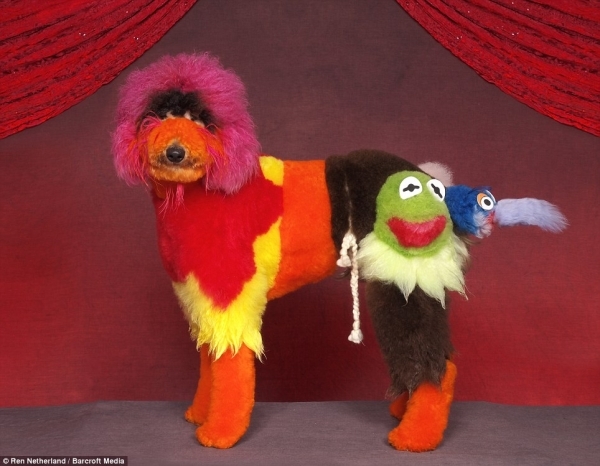 I love the use of color, differnet fur lengths, and the creative use of the dog’s tail! The paint is amazing, and I really like how the tips of the paws are black to simulate hooves. Wow! 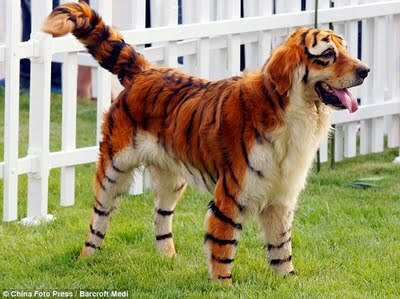 This dog had to sacrifice a lot of fur to make this look, but I love the mane and tail! 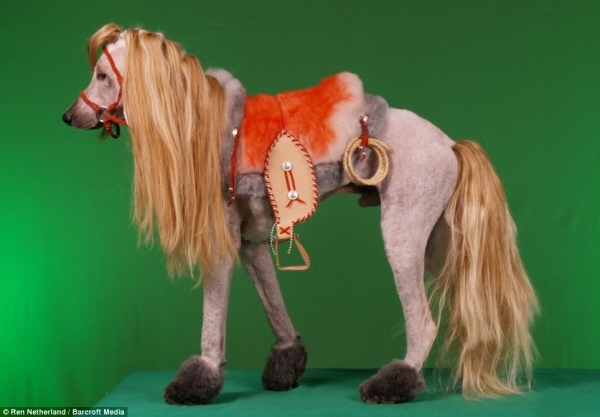 The hooves and saddle are a wonderful touch. 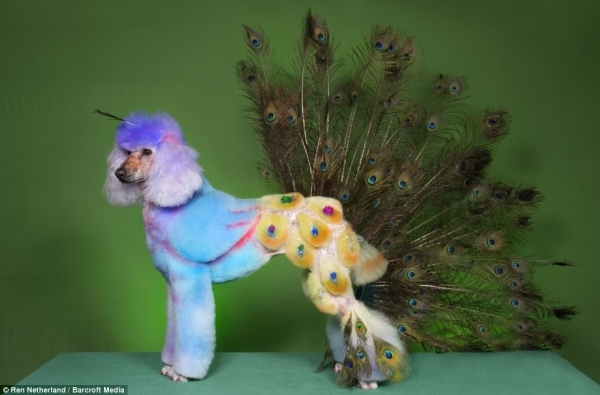 Very colorful, and I really hope that the peacock tail is a piece that the dog is just standing in front of and not actually attached to its back. 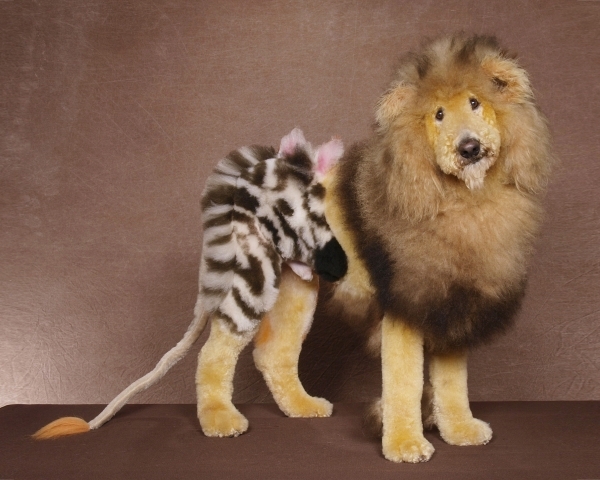 The mane is fabulous, I just feel bad for the saved tail! 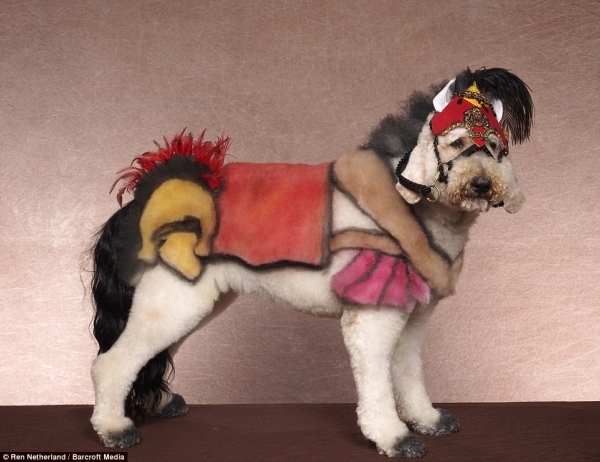 This puppy has nice additions to its fur for the feathers on the helmet, mane and tail, and its puppy bridal. 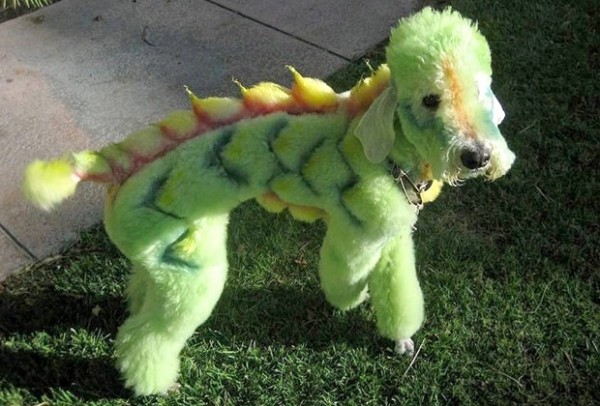 I am not sure what kind of reptile this is supposed to be, but the use of color and fur style are both simple and amazing. I love the macaw and frog designs on this dog! 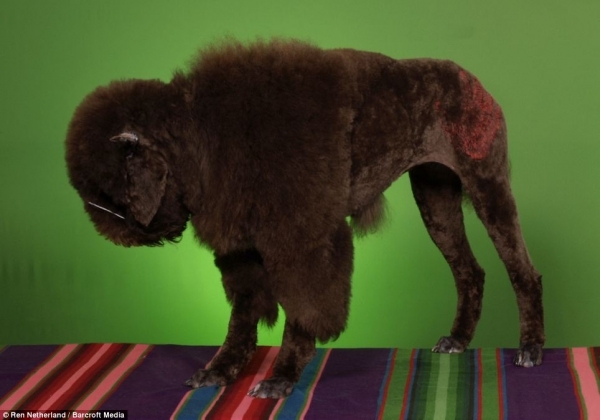 A cut of differing lengths really gives this dog the appearance of a shaggy bison. I love all the subtle details on this one. 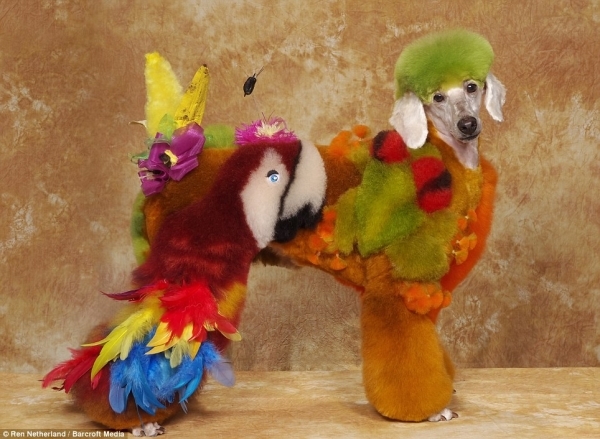 The little wings on the dog’s side, the front legs being colored yellow with feet above the puffs on its legs representing the nest/hay of the barnyard, the comb, tail feathers, and tiny nest with chicks really make this an elaborate and well thought out design. This one is easier to tell that it is a dinosaur! I love the teeth on it, eyes, and the creative use of the rest of the dog in the design. 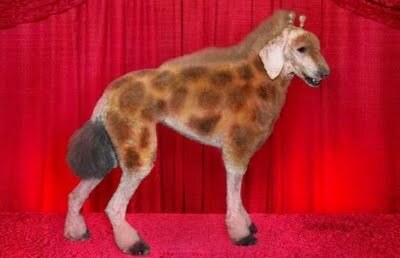 I found these photos at puppieslovers.net, to see these and more go to Weird Dog Grooming Photos. Just scroll past the ads and there is a bar with more pictures that you can click through.